Just about every industry today is being transformed by Artificial Intelligence (AI). From retail and entertainment to transportation and healthcare, AI is seeping into our world in ever more profound ways, revolutionizing the way we go about our daily lives. At Samsung Electronics, we share in the vision of a fully open, intelligent and connected world. A world where AI will play an integral role, where one day everything from our phones to our refrigerators will possess some sort of intelligence to help us seamlessly interact with our surroundings. To bring the company closer to realizing its vision, we are working tirelessly to develop technologies that can help us take this first leap into intelligence. AI – Where Are We Now and Where Are We Going? Since it was first envisioned in the 1950s, AI has made a palpable impact on our lives, giving us practical speech recognition, more effective web search and self-driving cars, among other innovations. Earlier this month, Google’s AlphaGo AI program made news by mastering the ancient Chinese board game Go in just three days without any human assistance. This major advance comes just two decades after Deep Blue crushed chess grandmaster Garry Kasparov, illustrating that AI has not only come a long way in a short time, but is on track to creating unthinkable opportunities across all industries that will add new value to our lives. The recent explosion in AI is enabled by a number of factors including a wider availability of GPUs, virtually infinite amounts of data, and more advanced machine and deep learning algorithms. Additionally, investments in AI have tripled from $26 billion in 2013 to $39 billion in 2016*, further propelling the development of new intelligent technologies. Despite these advancements, there are very real challenges that are hindering the development of AI technologies, including the lack of the required talent pool in the AI industry. Furthermore, many device manufacturers haven’t quite figured out how to best optimize the user data they receive from their sensor-equipped products. As a result, enterprises struggle to determine what AI is capable of and what kind of value it can bring to consumers. Samsung, too, has contemplated how AI can deliver real value to its users, and in doing so have developed Bixby, a bold reinvention of its intelligent interface that’s even more ubiquitous, open and personal. Powered by the Samsung Connect, Bixby will act as the controlling platform of your connected device ecosystem, including mobile phones, TVs and even home appliances to make the smart home experience even smarter. In fact, we are adding Bixby Voice to our Family Hub refrigerator. Now, you will be able to check the weather, build shopping lists and order groceries with the power of your voice. So, for example, if you were running low on milk, you would just say, “Hi Bixby, order milk” to order food directly from the screen. 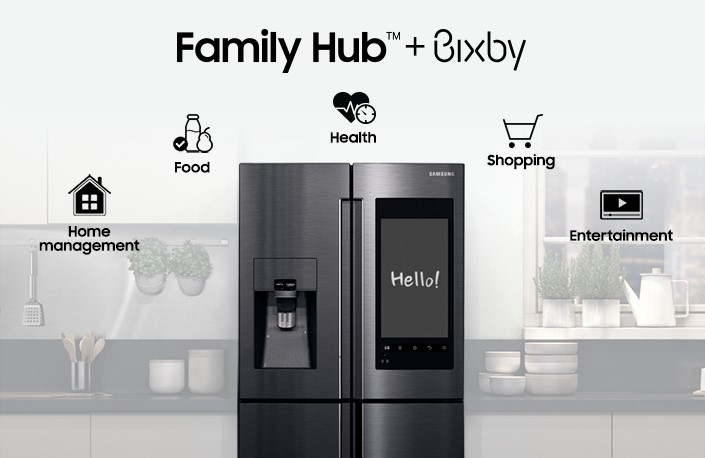 The integration of Bixby Voice and Samsung Connect into the Family Hub refrigerator marks a big step – one that will offer developers tremendous opportunities to develop new content, applications and experiences in areas such as food, health, home management, entertainment and more. A world powered by the Intelligence of Things will open up entirely new possibilities. In this world, every machine around you is intelligence-enabled, capable of understanding and anticipating your needs. In this world, mundane tasks are a thing of the past, allowing you to spend more time doing the things you enjoy with the people you love. We know that we have a long way to go to fully realize our vision. But we are wholly committed to building upon our heritage of creating meaningful innovation and driving digital transformation to advance technologies in artificial intelligence. We could not be more excited to help lead the changes that will define this new, transformative era. *MCKINSEY Report 2017 : Artificial Intelligence, The Next Digital Frontier?